For SNS group of companies, ABD architects executed two office design projects. The first one was realized in 2003 and was located in 23a on Tarasa Shevchenko embankment and had a total area of 1 800 sq. m. This project represents the second version of the company’s office, designed and executed by ABD architects. The office is divided into two zones: executive area with a huge reception zone, executive offices and conference rooms in the first zone and open-space working area and manager’s offices in the second. The floor height in the building was very small, so one of the objectives was to get the maximum possible height, which demanded much time and energy. Architecture, maintained in strict and elegant style, reiterates the company’s ideology: clear organization, functionality and simplicity. Monochromatic color palette was chosen with pure white walls, almost-black Wenge wood doors, steel elements and glass. The plot area of about 500 hectares proposed for the EXPO is located in the western part of the city on the picturesque shore of the Upper Iset pond, 3 km from the center of Ekaterinburg and close to the border that separates the European and Asian parts of Russia. 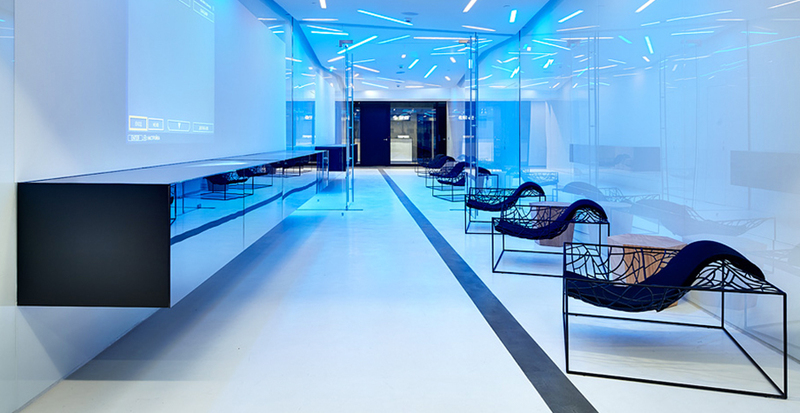 The office interior of the famous cosmetic company Estee Lauder leaves a feeling of lightness, agility and transparency, which is achieved through clear zoning, extensive use of glass and light-colored finishes. When you enter, you discover a completely enchanting gallery without any columns - an actual shopping street, lit by a skylight.